Illinois Attorney General Lisa Madigan ruled last week that Lyons School District 103 board members violated the state’s Open Meetings Act when they cut off public comment after 15 minutes at a heated meeting in October. The decision was sent to both Board President Marge Hubacek and Hinsdale attorney Martin Stack, who filed a complaint with the Attorney General’s office after the meeting. About 200 parents and local officials attended the Oct. 22 board meeting to demand answers about the hiring of Andres Rodriguez to teach sixth-grade English. It was later discovered that Rodriguez had been fired from two other school districts after he was charged with attempted murder after shooting a man seven times during a traffic dispute in Tinley Park. The district suspended Rodriguez once the charges became known. He was fired last month. Critics of the hiring claimed Rodriguez was hired over five other potential candidates despite widely known information that he was facing felony attempted murder charges. Critics of the hiring said Hubacek and her supporters ridiculed them during the meeting and closed the public discussion period after only 15 minutes. Only five people were allowed to speak and she turned away dozens of parents who wanted to ask questions about the Rodriguez hiring. One of those who tried to speak was McCook Mayor and Cook County Board Commissioner Jeff Tobolski. Hubacek denied him access to the microphone and closed the topic. “If she prevented an elected representative of hundreds of thousands of people from speaking, how does she treat the parents in the district? Does she even listen to them? Does she care about them? Parents should be concerned. I was concerned and that is why the complaint was filed,” Stack said after the Attorney General’s decision was released. School District 103 board member Jorge Torres, who opposed Hubacek’s decision and raised the issue about Rodriguez’s hiring, repeated his demand that Hubacek resign from the board adding that the board should immediately reconvene a new meeting to allow parents to speak. “Marge Hubacek has abused her powers since taking over the board. She has politicized the board’s actions and pushed aside the interests of the students and their parents,” said Torres. Calls for Hubacek to resign were made at a news conference held by Tobolski, Lyons Mayor Christopher Getty and state Sen. Martin Sandoval. Sandoval is sponsoring legislation that would require anyone hired by any school district in the state of Illinois who is involved in a felony criminal case to disclose those facts when applying for any school employment position. “There needs to be consequences for Hubacek’s actions,” said Torres, who is heading a slate of candidates seeking to oust Hubacek in the April 2 consolidated election. Torres’ running mates include Olivia Quintero, Winifred Rodriguez and Vito Campanile who are running on the Parents for Student Excellence slate. Hubacek has said she has no intention to resign. “I understand their emotions, but I was elected by the people. I wasn’t elected by the grandstanders,” she said after the October meeting. Stay up-to-date on issues and news at Lyons School DIstrict 103 by liking the Parents for Student Excellence Facebook Page. Click this link to go to the Parents for Student Excellence Facebook Page. 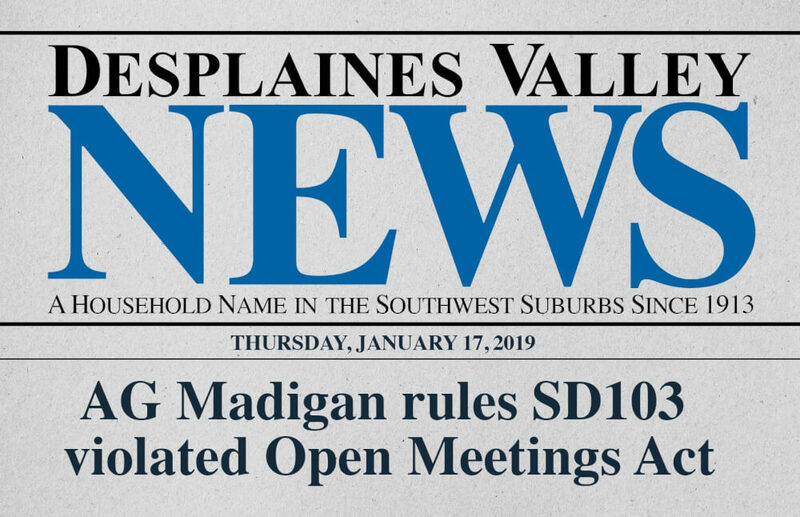 This article was published in the Des Plaines Valley News newspaper on Jan. 17, 2019. Republished with permission. THIS POST HAS BEEN READ 15622 TIMES SO FAR. THANK YOU!